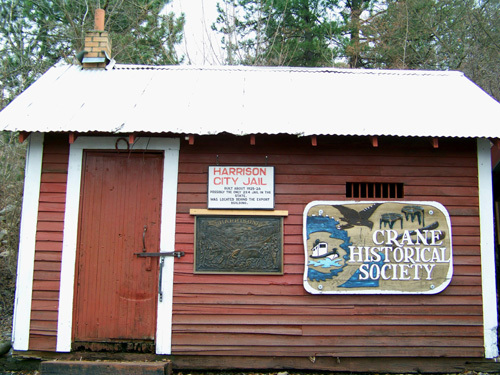 The Harrison Commercial District was added to the National Register of Historic Places in 1996. Access: Business & Public. Lakeside Bar and Grill at Gateway Marina, C-Store, and HI Water Adventures boat rentals. Public docks. Access: Businesses. 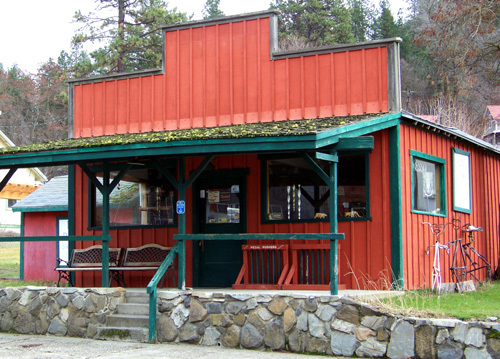 The Company Store, Bird's Nest , Laundromat, Commercial Storage Units. Access: Businesses & Private. One Shot Charlie's saloon and The Cafe on the lower level. 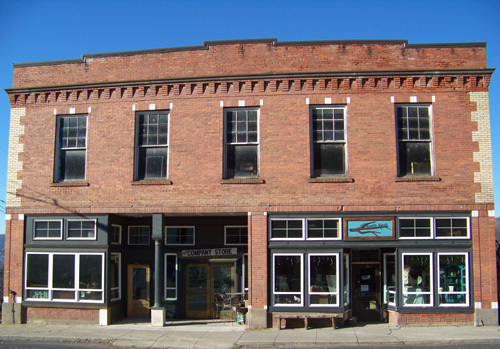 The Gallery in Harrison, O'Susanna's Design Studio, Grubby Girls Soap, and Tin Cup Coffee Shop are on the mid level. Residence upstairs. 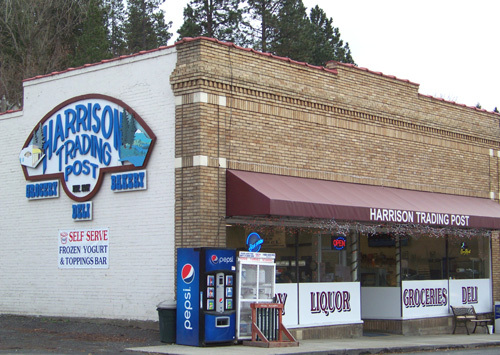 202 S. Coeur d'Alene Ave., Harrison, ID 83833. Vacant lot between the Harrison Building and Gig's Landing. 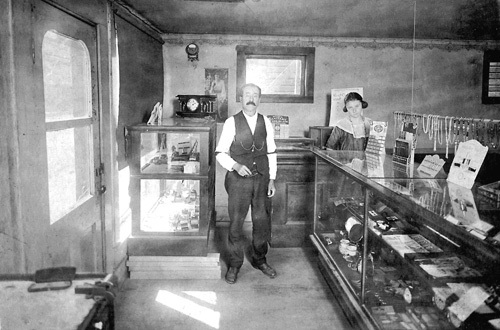 Fisher's Jewelry stood here in the 1920s. It later became a real estate office. In 2003 the building was destroyed by fire during the Old Time Picnic weekend. Access: Business & Private. 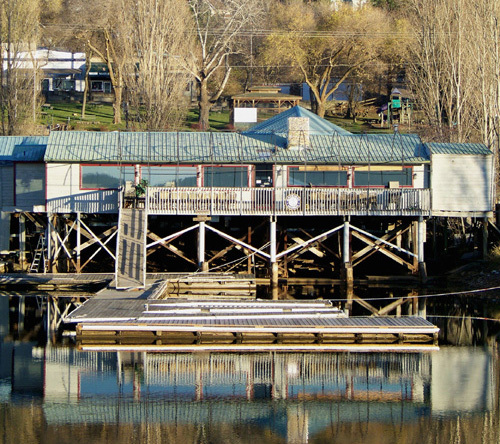 Gig's Landing restaurant. Residence upstairs. Access: Business. 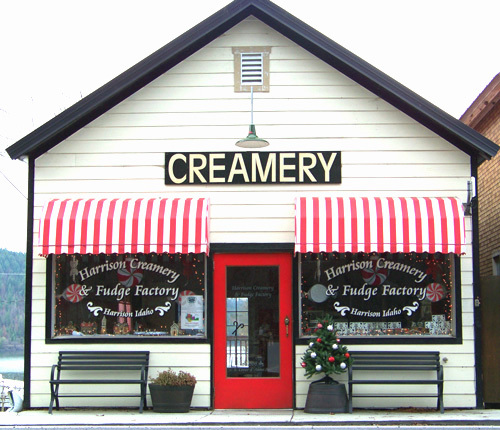 The Harrison Creamery & Fudge Factory. Access: Private Property. Baptist parsonage. 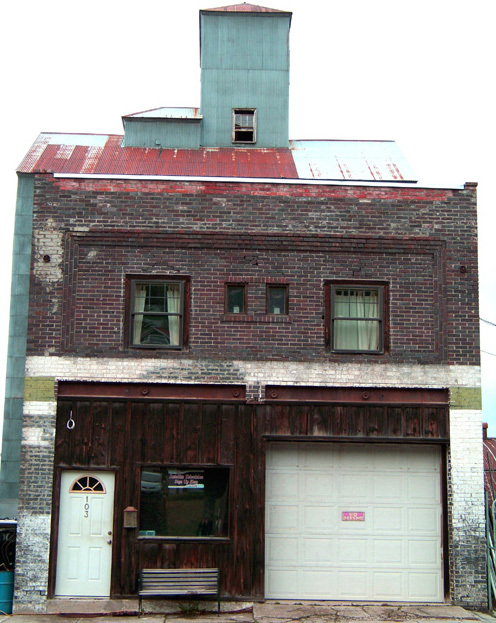 Built by Mr. Burton, c. 1901, to house the Steam Laundry. The walls are 20" thick concrete and steel bars covered the windows. The laundry was only in operation for a short time. 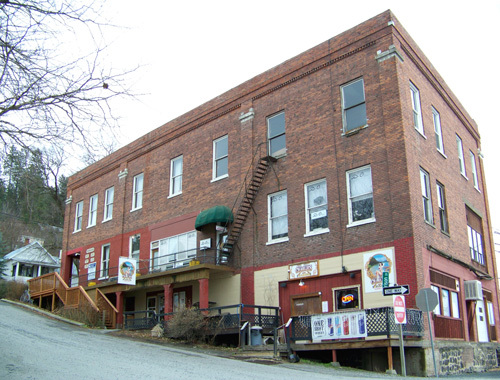 After Mr. Burton died the building stood empty until the mid 1940s when Russ Vetter had a plumbing business here. Ownership transferred to Howard Russell, who used it for storage. 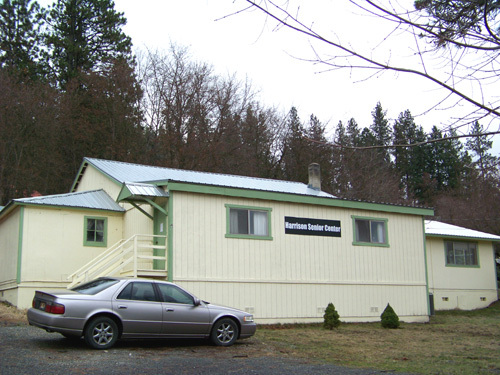 Recently, the property changed hands and some items that had been stored there for many years were transferred to The Company Store on Coeur d'Alene Ave. 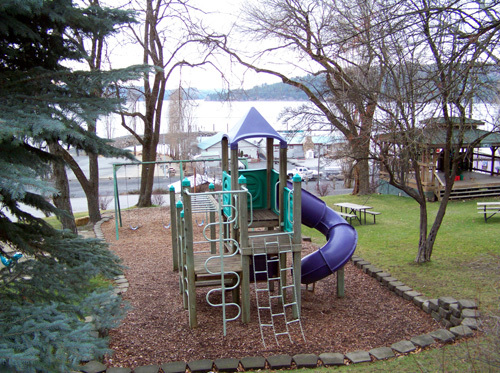 Looking west toward the lake, notice the path that leads to the Trail of the Coeur d'Alenes from Lakefront Drive. This was once a wooden walkway to the train depot and steamboat stop. Two-cell jail house was built in 1925 entirely of 2x4 lumber and sided with clapboard. A small slit window with metal bars is cut into the front. This jail was built after the first one burned down while Claude Knaggs was constable. It once stood immediately south of the Grant building. Access: Organization. Harrison Grange #422. Open to public during events. Access: Business. Country Fair store. 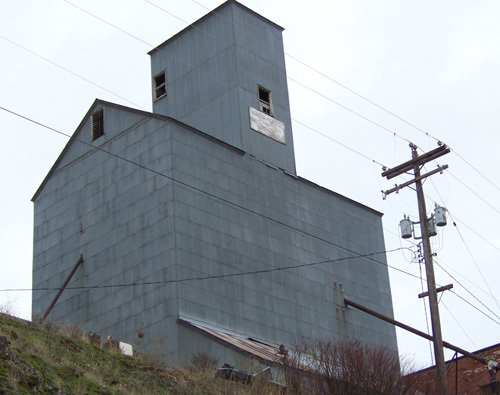 This building housed The Paulsen Grocery Store and F.E. 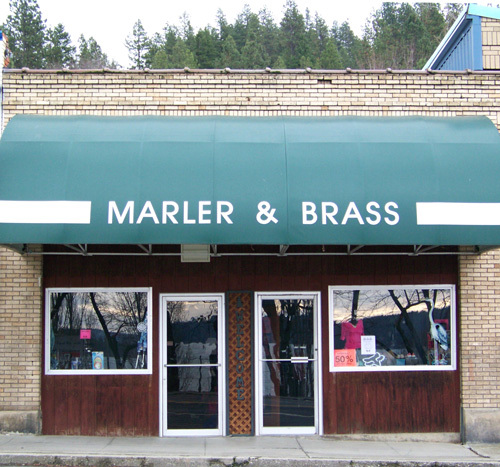 Marler and Gustav Brass' meat market and sausage factory. 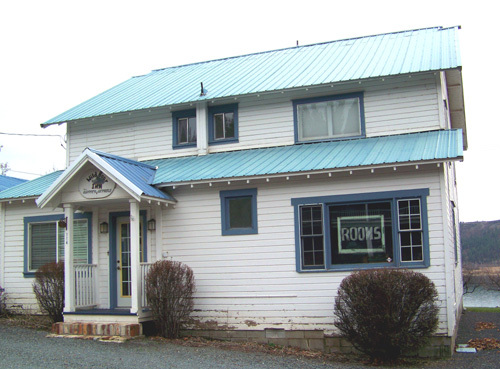 More recently, attorney offices and The Creamery ice cream shop have leased the space. Currently Country Fair, a resort shop. Access: Business. Sheppard Fruit Wines tasting room. 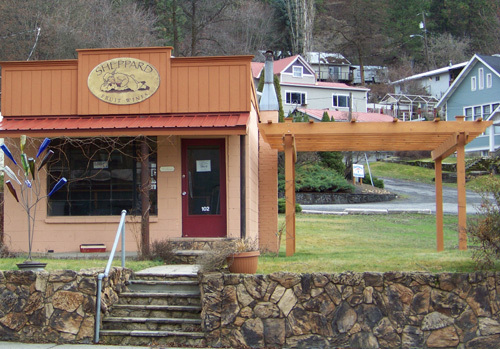 ﻿This shop was built by Tom Collier with wood salvaged from the old train depot and served as a barber shop. Date is uncertain. After that, a local teacher used it as a residence. Beginning in 1966, it housed the popular Jewel Box gem shop owned by Al & Glenna Ross. It had a glass case from the Corskie store. The case is now in the museum. For a short while it was a gift shop called the Crow's Nest. The first Baptist Church burned in the 1917 fire. 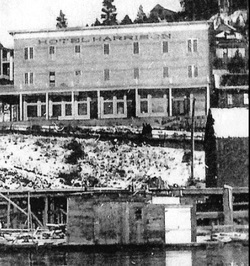 It was rebuilt in 1921 with exceptionally good acoustics and natural cedar exterior. Beautiful stained glass windows add to the warmth and charm. The piano downstairs was rescued from the fire. This is the site of Addison Crane's home- stead. The old city hall and library occupied the spot for many years. Mr. and Mrs. Albert Mault built the Gateway Apartment Motel in the winter of 1961 at an estimated cost of $100,000. 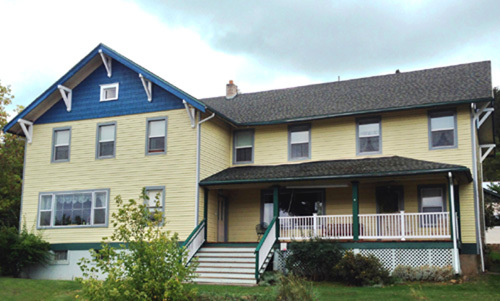 The motel is now owned by Paul and Suzanne Hoskinson, who have provided major renovation. 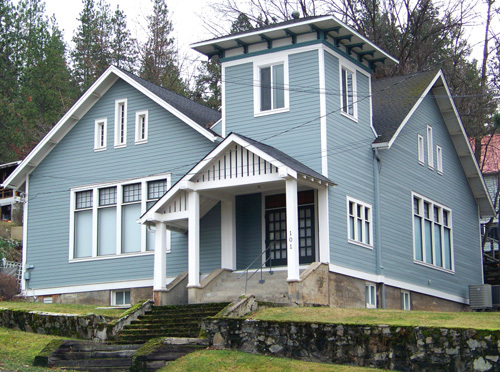 This house was built in 1918 for pharmacist John Corskie, after the 1917 fire destroyed his home. In addition to operating a drugstore for more than 50 years, Corskie served as bank president and city treasurer. Owned by Russ Wilbur. 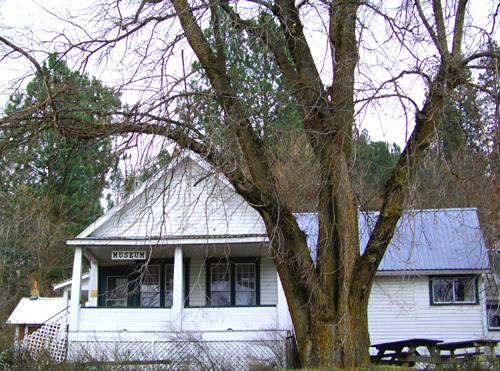 Originally built in 1915 by the Export Lumber Company as a boarding house for lumberjacks, the ground floor served as a hospital for a short time in the 50s. It sat empty for a long time. 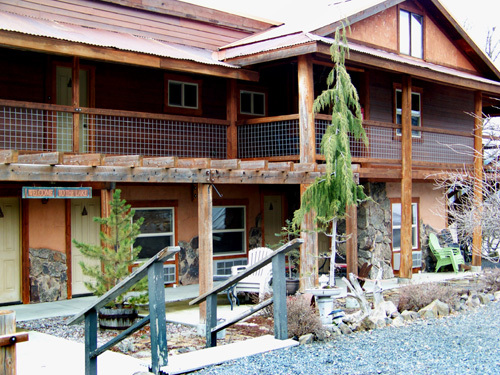 Jim and Arleen Woodside turned it into a B & B. 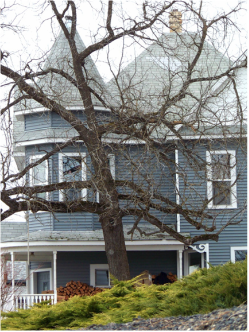 The property was purchased in 2015 by the Skardas who operate it as a boutique hotel/B&B. Access: Private & Pubic. School - Private Property. Gym, basketball court, and parking lot are public, owned by City of Harrison. Edwin Crane lived in a house here on his homestead. 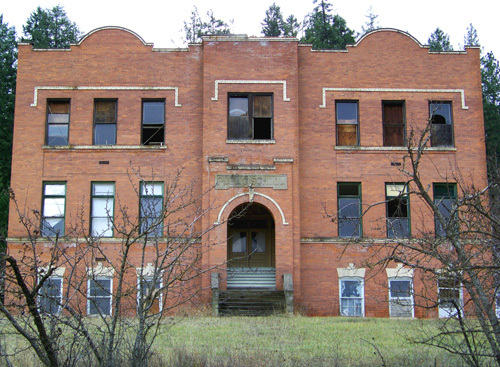 He sold the property to the school district in 1907 and moved to Spokane. The brick school was built in 1909 for grades one through twelve. 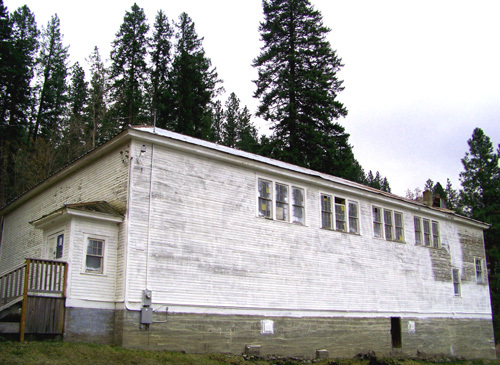 The gymnasium was added between 1923-29 for basketball, boxing, and drama events. 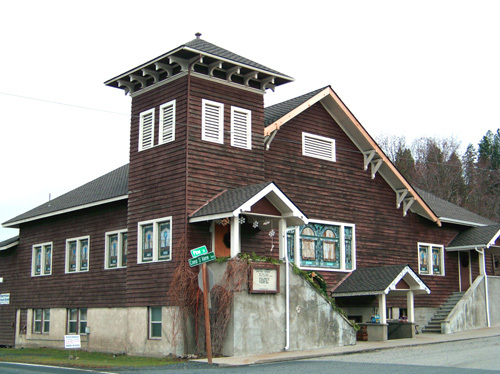 It has served as a venue for dances, community theater, and other community events since 1952. 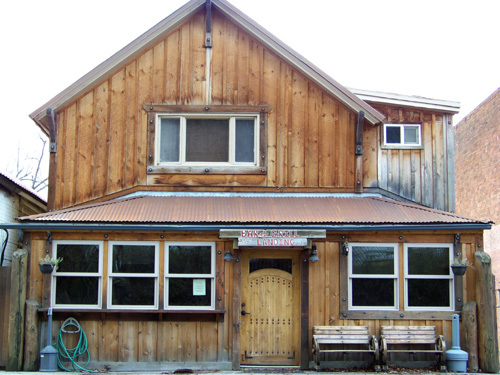 These days the Chamber's annual Boot Scootin' Boogie fundraiser takes place here in May. Access: Organization. Open to the public for certain events. The original Catholic Church burned in the 1917 fire. 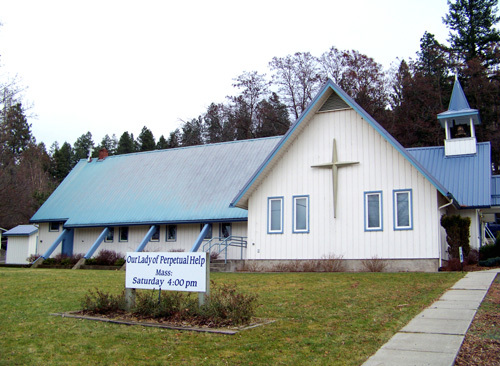 This one was built in 1961, largely through the efforts and generosity of Joseph Kroetsch. Before that, mass was held in a residence that was converted to a chapel. The Masons came on hard times and were unable to keep up with taxes. Event-ually they bought this build-ing from the Methodist Church. It is currently a private art studio. Closed to the public. Mr. and Mrs. Monte ran a grocery store here. 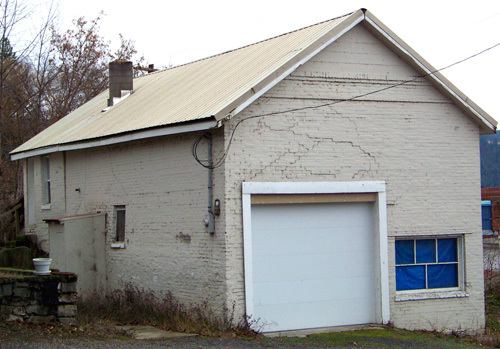 It was later a confectionery, then was used by the Emanuel Mission Church during the 1940s. The Jean Blancs used it as a welding shop. If you have a comment or correction about a story on this page, please contact us. Please specify the number or name of building you are referring to. Note: Historical photos on this page are courtesy of the Crane Historical Society. The photos are available for purchase from the society. Please drop them a line or stop by the Crane House Museum during visitor hours.